Q: We have a maintenance process that works well when knowledge owners participate. Any recommendations on HOW to get reluctant knowledge owners to participate? 5 = greatest impact, 1 = least impact. 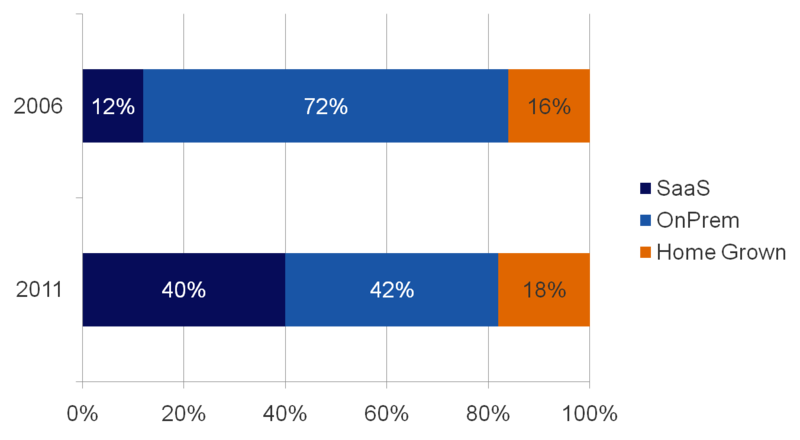 As you can see, KB contributions have the least impact on employee reviews of any element surveyed, so companies are not doing a good job today of making KB activity a priority in the minds of employees. The alternative is the stick, meaning employees who do not contribute, or who regularly contribute garbage, must receive some sort of disciplinary action, typically a lower score on their performance review which impacts raises and bonuses. But beyond these basic employer avenues, here are some other hints. From drudgery to challenging. Many people who don’t want to contribute to your knowledge efforts are coming from a place of insecurity. They’ve worked hard for their knowledge, and they fear if they share it with everyone they will no longer be valuable. As a manager, I could usually solve this easily by coaching them that documenting their knowledge means someone else can now solve those redundant issues, leaving the employee to work on more interesting and challenging problems. Sell them on the ROI. One of the biggest employee complaints about new technology is it “shoved down their throat.” Be sure everyone is on board with the KM project BEFORE it goes live–let employees sit in on demos and participate in beta tests. If they understand the value of KM to the organization, and how the tool improves performance AND makes the support tech an expert on every problem, it is easier to get them on board and participating. Learn from high achievers. When you identify top contributors to the knowledgebase, don’t just reward the high achievers, share their secrets. Have them talk at staff meetings about how they write articles, give examples of good and bad articles, use analytics to show the impact of good knowledge (linked to solved incidents, for example), etc. Be sure you have good editors in place, and templates that make writing easy–even for those who find writing a chore. What else have you tried that works? Please add a comment on how you tackled this issue in your environment. And as always, thanks for reading! John Ragsdale: What a great eBook! I’ve been asked to review quite a few books on support operations, and most are pretty dry. The layout, color and use of graphics in “Get Fit with Innovative Product Support” make this a fun read. While clearly my body hasn’t seen the inside of a gym for a decade, I also like the way you frame the discussion about embracing new technologies, tools, services and processes by comparisons to personal health and fitness and exceeding health goals. How did this analogy between personal fitness and support organizational fitness first occur to you? Alon Bar: Well, for me doing sport was always a way living, I have played Handball in a league for about 10 years since I was 7 years old, I have also practiced Karate for more than 15 years till recently, and along the way I did some wind surfing, snowboarding and so on, so when I brainstormed with my marketing team about a creative concept for this eBook, it was just natural that this idea that came up became the winning one. Ragsdale: Innovation is a recurring theme in your book. In my experience, the most high performing companies embrace innovation and change, and are in a constant state of flux. They also have a healthy appetite for risk, because being innovative means sometimes you fail. Unfortunately, I would say companies that embrace innovation, especially around technology, remain in the minority. How do you encourage companies to take a chance on innovative tools and processes, and get beyond their fear of change? Bar: In the last 2-3 years we have enhanced the value of our support offerings to our customers with many new services, tools and processes. Two of the most significant innovations which required also the highest investment are probably our automated support tool which allows real-time analysis of application logs and problems identification and is also Integrated with our support knowledge base to find immediate solutions, and of course our product support community which is fully integrated with the support self service and knowledgebase. I can tell you that if these two projects were pending a straight forward ROI, they wouldn’t exist today. But the value and recognition they are bringing today are beyond doubt. Ragsdale: One of the trends I’ve noticed in customer behavior is an increased demand for personalization: customers want to feel that you understand their unique environments and challenges, and don’t give them “one size fits all” service. You discuss some approaches to personalizing support in your book. Could you give us some examples of personalizing the support experience? Bar: I won’t spoil it for those who want to read the eBook, but to give just one unique example from the recent year – we have launched a new program called “Product Support Stakeholders” comprised of selected Production/Application Managers from customers that have experienced our products and are able to share their personal views with regards to our product support and maintenance services. This program will allow us to implement valuable service improvements in our Product Support offering. By now we have engaged more than 25 representatives from our customers into this program, and as I write these lines, 6 of them are taking part in a unique product support summit we have organized for them as part of the company yearly customer’s event. Ragsdale: Obviously social media is impacting support in a big way, from new support channels to product idea storming. My 2011 spending data shows companies continue to have a sizeable budget for online communities and social media. How do you see social service impacting support operations and technologies? Bar: As I have mentioned earlier we have launched a product support community last year, and I’m glad to tell that the joining and participation rate are in some cases even exceeding our targets. One thing I can tell to our readers – if you are not there yet, if you are still hesitating, do it! If you do it right it will become one of your most valuable support assets. Bar: The Product Support organization is defined as a stakeholder in the product development methodology with the responsibility to define product supportability features. A few examples of supportability features engineered into our products, services and processes in the recent year or candidate for coming versions includes: introducing new features in already released versions rather than waiting for the next version, smooth and easy patch bundles and hot fixes installation, standardization of error messages, and adoption of automated installer across products. Thanks for reading, and be sure to check out Alon’s eBook, “Get Fit With Innovative Product Support“. One of the many things our intrepid Events Project Manager, Christi Holzer, does at each event is send me a list of top attended sessions for the previous day. I see this as great information, indicating the hottest topics and trends. For Tuesday’s sessions, one breakout proved extremely popular with 129 attendees! Here are the top attended sessions for yesterday, each receiving more than 70 attendees. Support Services: Transform or Perish? In the last few conferences, our top attended sessions were all panel discussions. Not only are panels a nice break from the traditional “stand and deliver” conference speeches, but you get to hear from a variety of companies, each with a unique perspective. This panel discussion, with standing room only at 129 attendees, included Ana Pinczuk, Vice President, Cisco Systems; Medi Goker, Vice President, Proactive Support Center, Oracle; Dave Cutler, Vice President, Global Technical Support, Novell; Todd Hewlin, Managing Director, TCG Advisors; and Brad Smith, Vice President, Global Support Experience, Yahoo! The Five Myths of Customer Service Satisfaction: Setting Your Sights on the Right Targets. This session, presented by Michael D. Clarkin from Sykes Enterprises, had a whopping 95 attendees (in a room designed to hold 70), covering an increasingly political topic: customer satisfaction. I can vouch for the quality of this content; we recently did a webcast with Michael on this topic–you can watch the OnDemand version on the TSIA Website. Start the (Metrics) Revolution. Another topic usually on the top attended list is online communities and social media, and this year was no exception. This session, led by Francoise Tourniaire, FT Works; Rob Shapiro, Oracle; and Shawn Santos, TSIA, examined the evolving world of metrics for social service with an eye toward creating some standards and best practices. The session had 83 attendees. Moving Beyond Break-Fix: New Metrics for the Brave New World of Outcome-Based Support. I’m very tickled to see this session make the top attended list, with 81 attendees, because I was moderator for the session. Phil Verghis of the Verghis Group, and Marco Bill-Peter from Red Hat, discussed Red Hat’s impressive journey from reactive metrics to outcome based support, including a big focus on knowledge centered support (KCS) to improve knowledge management creation and use. I really enjoyed the session–Marco is a bit of a rock star–and several attendees told me afterwards it was the best session they attended so far. Phil, always pushing new approaches, challenged some best practices–including benchmarking–and gave me a LOT to think about. Agents, Answers & Taxes, an Intuit Case Study: Centralized Knowledge – Better, Faster Answers for Customers. Knowledge management is always a hot topic at TSW, and it is no surprise a case study from Intuit made the top attended list with 78 attendees. Can you imagine supporting TurboTax the week before April 15th? The session, led by Jody Weir and Patsy Nations from Intuit, and Chris Hall from InQuira, recapped Intuit’s journey to consolidate to a single enterprise knowledge platform to service 5,000 agents and over 26 million customers in just 6 months. Why and How to Build and Successfully Launch a Premium Technical Support Business. Clearly finding new ways to generate services revenue is a challenge for every TSIA member, and in this session, with 78 attendees, Wynn Grubbs from PlumChoice, a leading provider of white label Technology Care solutions for their partners’ consumer and small business markets, discussed proven ways to provide scalable premium technical support to your customers while reducing costs, increasing revenue and improving customer satisfaction. I had dinner last night with the PlumChoice team, and Wynn said he had a full room for his session–and indeed he did! Making the Tangible Real for Customers: Best Practices for Marketing and Selling Professional Services. This session, led by Lance Miller, Vice President, Global Services Marketing, Teradata and Thomas Lah, Executive Director, TSIA, discussed best practice approaches to marketing professional services that result in excited customers who are motivated to buy your offers and empowered sales reps who are comfortable leading the services sales discussion. The session had 76 attendees. Using Social Support to Enhance Knowledge Sharing and the Customer Experience from VMWare and Consona. Another great session on social media, and another great customer case study from an early adopter. This session was presented by Lynn Llewellyn, Director, Knowledge Management, VMware; and Gregg Palaian, Customer Account Manager, Consona CRM; and explored how VMware’s introduction of social media into the support organization has enhanced knowledge sharing and transformed the way they communicate with customers. The session had 75 attendees. Resolution Management Index: The New Industry Standard for Measuring and Managing Case Resolution. Retired from TSIA but still making waves in the industry, SSPA’s founder Bill Rose, now CEO of Bill Rose I.N.C., along with Dave Brown, President, Support Center University, walked attendees through the process they used to develop the new Resolution Management Index, a sophisticated approach to understanding a very complex metric–incident resolution time. The session received 72 attendees. Now, off to start Day 3! Thanks for reading! Yesterday at Technology Services World I presented the findings of my 2011 Member Technology Survey during the TSIA Power Hour, a series of breakouts lead by TSIA Research and executives. The 2011 Spending Reports for each discipline (support services, professional services, field services, education services) are now available to read or download from TSIA.com. Planned spending remains very high. During the down economy of 2008 and 2009, there weren’t a lot of new technology purchases happening. That changed last year, with the 2010 survey showing high member spending in many areas, including communities, intelligent search and mobility tools. Interestingly, though spending remains very high again this year, especially for communities and knowledge management, adoption did not increase dramatically from last year. This indicates to me that while companies have dollars to spend, the sales cycles are growing longer and stretching into this year. This is partially due to tough competition for deals, but also because CIOs are pushing some support projects to broaden into enterprise projects–especially around knowledge management and search. Communities are king. Online communities and discussion forums have been on the top of the spending list for 3 years now, and they top the list again in 2011, with 48% of members having budget for additional community tools in 2011-2012. But these aren’t all support communities–adoption of community tools for employees and partners are growing as well, with increased adoption of forums across professional services and field service. 2011 kicks of major overhauls of infrastructure. One of the top complaints from members in the last 5 years has been that they are unable to upgrade to the latest versions of CRM because their infrastructure is so old and heavily customized that IT keeps delaying a massive migration project. Well, it looks like 2011 may be the year some of these 15 year old CRM/ERP platforms are being upgraded or replaced. Spending on CRM is high for the first time in 5 years, with 37% of members having budget for additional CRM tools in 2011-2012. OnDemand or else. When building the short list of vendors, everyone wants at least 1 SaaS solution included for comparison. The rapid growth of SaaS tools is impressive–check out this data comparing the percentage of members using a SaaS product for incident management. Only 12% were using an OnDemand tool in 2006, but that number has jumped to 40% today. Keep in mind, however, that there are tradeoffs between ease of use and functional complexity–OnDemand is not the best fit for everyone. I’ll be back later with more inside scoop from TSW. Thanks for reading! What will you look to consultants for help with in 2011? One of the surprise findings of my 2011 Member Technology Survey is the incredibly high spending planned for industry consultants. In fact, 48% of respondents said they planned to use a consultant in 2011-12. TSIA has created a network of industry experts on a lot of topics, and now I’m curious what areas will be the recipient of all this planned consulting? Please respond to this survey indicating what area(s) you need business consultant assistance with in the coming year. Today kicks off our Spring 2011 Technology Services World Conference in Santa Clara, CA. As our interest areas have grown, the number of concurrent tracks is up to 8 or more sessions, so I wanted to highlight some sessions of interest to our tech savvy support services members and partners. The professional development courses just kicked off, with good size audiences for topics such as Knowledge Management with David Kay and the ROI of Communities with Francoise Tourniaire. Also starting this morning are advisory board meetings and some communities of interest meetings. I’m speaking to the Support Services Champions group at 11:30 on technology adoption and spending for community and social media tools. The first event at TSW this year is my Innovation Tour at 1pm in the Expo, right before the opening keynote speeches. Join me at the Solutions Stage to hear an overview and see a live demo from each of the finalists in our Spring 2011 Recognized Innovator Awards. The audience will vote for ‘best in show,’ and we’ll have a prize drawing as well, so don’t miss it! The opening keynotes are from 2-4pm, with my boss Thomas Lah and Anand Eswaran, Vice President, Global Professional Services Software and Solutions, HP. After the keynotes we will have the first round of breakout sessions from 4:15-5:15, called the Power Hour. The Power Hour sessions are lead by the TSIA Research team and executives. My session, in Grand B, is The 2011 TSIA Technology Heatmap: Service Technology Spending and Adoption Trends, in which I’ll go over the results of my 2011 Member Technology Survey. Copies of the report for each discipline are being published to our website today. At the welcome reception in the Expo, starting at 5:15pm, I’ll be on the solution stage talking about the Heatmap, and interviewing a partner, Intermec Technologies, about trends in mobile service and how to mobilize your field service workforce. Tomorrow morning at 9:45 I’m doing a Partner Group Advisory Session, an invitation only event for TSIA partners, in which I’ll discuss the results of my Member Technology Survey specific to partners. Tomorrow at 11am all of the breakout session are case studies about innovative technology and services, including proactive support, social service, knowledge management and Web chat. Something for everyone! For those of you who love technology, the big event is Wednesday, the TSIA Vision Awards Competition, with members, partners and some tech startups demoing their coolest products. The audience votes live for their favorite, and awards are presented to the winners. Stay tuned as I pass along trends, gossip, hallway conversations and anything else of interest from TSW! and as always thanks for reading! You are currently browsing the Ragsdale’s Eye on Service weblog archives for May 2011.